I’m a fairly rational, reasonable, moderate person by nature. The problem is, I live in Arizona, where these things are not taken as virtues, but more like strikes one, two and three. Nowhere can this be seen quite as vividly as in the workings of our state legislature, where even the words ‘rational,’ ‘reasonable,’ and ‘moderate’ were banned for awhile because someone thought they might have Spanish roots. Case in point: this year the legislature passed a bill that allows hunters, for self defense purposes, to carry a handgun while in the field. I’m still trying to figure this one out. Have these people seen one too many “I support the right to arm bears” bumper stickers? Are hunters in this state really running across murderous thugs in the middle of the wilderness (although it is well known that many murderous thugs enjoy the serenity and solitude of nature)? And if so, are they really pausing to say to themselves, “What am I going to do? I’ve got this loaded shotgun in my hands, but I only use that for hunting. If only I had my Glock 9mm pistol right now. Maybe I can find a rock or a big stick…” Are our outdoorsmen and women really struggling with this dilemma? Of course they aren’t. One thing we should all know about Arizona by now is that we like to make emphatic points. And you have to admit, a Remington semi-automatic 30-06 in one hand and a .357 in the other is, if nothing else, pretty emphatic. Yes, we here in Arizona are big believers in the symbolic gesture. Perhaps you saw the photos of our governor wagging her finger in our President’s face, or the more recent effort by our secretary of state to demand proof of birth from the state of Hawaii before putting the same President on the ballot for reelection this year, or the effort of certain members of the state legislature to nullify the fourteenth amendment of the U.S. Constitution. Why, just the other day I had to refuse one of those signature-gathering people outside the library, something I almost never do. Even if I don’t agree with a proposed proposition, my typical attitude is sure, let’s vote on it, because I trust the sensibility of my fellow citizens more than I do my legislators. But this was different. The man asked us if we would sign a proposition proposal saying that our state could decide not to follow federal laws that we don’t like. We politely told him we would not sign any such thing. In retrospect, maybe we were too polite; we should have tarred and feathered him first, and then rode him on a rail out of town. By the way, when I say we, I mean myself and the Founding Fathers I was with. They all helped, except for Jefferson, who always seems to have some urgent business to attend to when it’s time to actually lift anything heavier than a pen. In this case, he said it was an emergency call from his massage therapist. I mean, really, who gets an emergency call from their massage therapist? Anyway, we do love our symbolic gestures. In fact, we find them vastly superior to actual gestures. Unless the actual gesture is something like arming college students and faculty members, another recent proposal, so that they can settle disputes over grades like men. On the plus side, under this bill women would also be able to settle their disputes like men. And, really, when you stop to think about it, isn’t that what equal rights is all about? Some may question the wisdom of allowing random reenactments of the O.K. corral gunfight in our classrooms and lecture halls, but I can see the genius behind it. After all, what a boon to tourism it would be. People would no longer have to drive all the way to Tombstone to see a good, old-fashioned shootout. We could set up viewing galleries on our community college and university campuses to accommodate the observers. Heck, we could install some gun racks so spectators could join in the fun if they wished, or even kick-start the action if things got a little too boring in Economics 104, or if there’s a little too much learnin’ and not enough shootin’ going on in Math 160. Unfortunately for the tourism industry, however, it’s back to the drawing board on that one, because the vote came up ‘a few nuts shy of a pecan pie,’ as my mom likes to say. Out of this chaos it appears that Laurie Roberts, a brave and talented columnist for the Arizona Republic, has decided that two can play the gestures game. In her column dated June 2nd, she announced the commencement of ‘Operation Dekookification,’ the first organized resistance movement to challenge the dominant crackpot contingent in the Arizona legislature. She has willingly thrown herself into the void in an effort to reverse the downward slide and bring together the lonely, isolated voices of the rational, reasonable, and moderate (notice I didn’t say particularly brave) people of the state. Her approach is one of addition by subtraction. If we concentrate on eliminating the kookiest members of the legislature, the reasoning goes, we can vastly improve the operational sanity of the entire state. You know, kind of like when we finally got rid of Buddy Ryan. Her strategy for accomplishing this goal is simple, yet savvy. Instead of focusing on the general elections, which in Arizona tend to just be called republican parties, as in “the party will be at the Scottsdale Princess resort Tuesday night,” she boldly suggests we turn our attention to the republican primaries, where many of our great kooks of note have been coming from. The success of her strategy depends directly on independent voters, who have the unique ability to vote in either the republican or democratic primaries. This is where I come in. I am one of those independent voters who has never voted in a primary election before. I suppose it’s mostly because I despise both political parties, or maybe it’s just because I treat elections the way I treat college football: I don’t start paying attention until the bowl games start. Whatever the reason, Ms. Roberts’ column made me realize something pretty unflattering about myself. By not voting against some of these maniacs in the primaries, I actually bear a tiny bit of responsibility for upping our state’s kook quotient. Through my own reluctance to get down and dirty in the pigpen of partisan politics, my inaction actually helped elect some of the very kooks who have lately been causing me to contemplate moving to a less kookified regime, say Idaho, or South Carolina. Of course, only time will tell if Ms. Roberts’ gesture grows into something real, or if ‘Operation Dekookification,’ like so many of our finest gestures, is to be relegated to the strictly symbolic section. 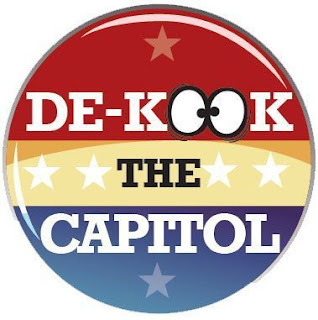 That’s why I want to strongly encourage the Arizona Republic to pony up for some ‘Dekook the capitol’ buttons. I want something I can wear, something I can hold and touch and know is real, something that says the movement exists. Also, showing it might be helpful in gaining acceptance to another state if I and my family are ever forced to flee Arizona. In conclusion, thanks, Ms. Roberts, for showing a rational, reasonable, but despairing, soul the error of his ways, and for restoring hope to someone who had come to believe that hope was something reserved only for people who leave Arizona, and go to Vegas. Your rabble-rousing column has inspired me to rouse myself and join the rabble. I feel I have a renewed political purpose: I’m going to get my early voting republican primary ballot, and vote for the least crazy individuals I can find. If enough of us independents across this great state do the same, maybe we can start putting the fear of God back into these wackos. Working together, we could be the RID, the delousing shampoo, to our infested body politic. Or the monkey who picks the nit-wits off our monkey-mate of state, and eats them. Alright, that was a gross analogy. But you get the point. Thanks again, Ms. Roberts. Oh, and we definitely are doing the button thing, right? Three words: Guns in bars. Drunk People and guns. Seems like a dangerous mix to me. Whether a drunk person drives from the bar in their car, or pulls out their gun at the bar, they're both using weopons, right? And, not thinking clearly because of the alcohol! Twelve Words: Why is our sherrif investigating the legitamacy of the president's birth certificate? Shouldn't we wonder why he has the time to do this and if he's using public resources to do it? If he does have the time to fully dedicate to this investigation, why is he so available to do so?